ILYSMB | What Does ILYSMB Mean? ILYSMB means "I Love You So Much, Baby". ILYSMB is one of the ways of telling someone you love them. 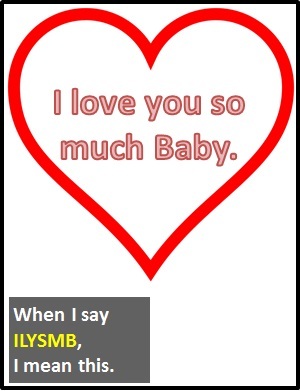 "I love you so much, baby" (ILYSMB) is one of the ways of saying "I love you" online. Woman: You're so strong, so clever, so capable, so handsome. ILYSMB. Man: I love you too. Um, did you want something? Person A: I can't believe I've met you. ILYSMB. Person B: I know. Of all the bars in all the world, you had to pick this one. ILYSMB is a declarative sentence (i.e., a statement). In other words, it is not used as a part of speech in a wider sentence. When written in full "I love you so much, baby" should have a comma before the word "baby" to show the vocative case (i.e., to show that you are addressing someone directly).